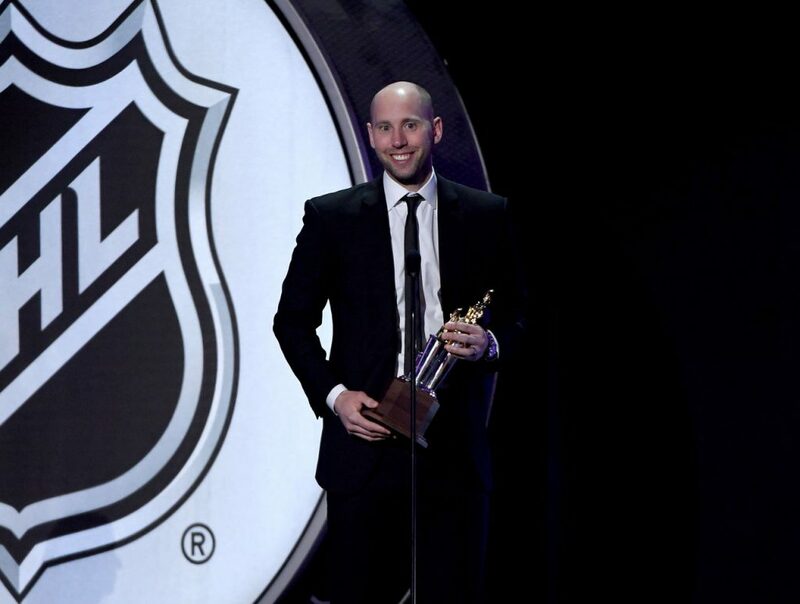 Goalie Craig Anderson of the Ottawa Senators received the Masterton Trophy at the 2017 NHL Awards and NHL Expansion Draft presented by T-Mobile in Las Vegas on Wednesday. The award is given to the player who exemplifies the qualities of perseverance, sportsmanship and dedication to hockey. The other finalists were Anaheim Ducks forward Andrew Cogliano and Carolina Hurricanes forward Derek Ryan. Anderson, 36, was 25-11-4 with a 2.28 goals-against average, a .926 save percentage and five shutouts in 40 games this season. He had to take several leaves of absence to be with his wife, Nicholle, who was diagnosed with nasopharyngeal carcinoma, a rare form of throat cancer, in October. One of the most memorable moments of the season came when Nicholle told Craig, “Your team needs you,” after backup Andrew Hammond sustained a lower-body injury during a 5-2 loss at the Calgary Flames on Oct. 28. 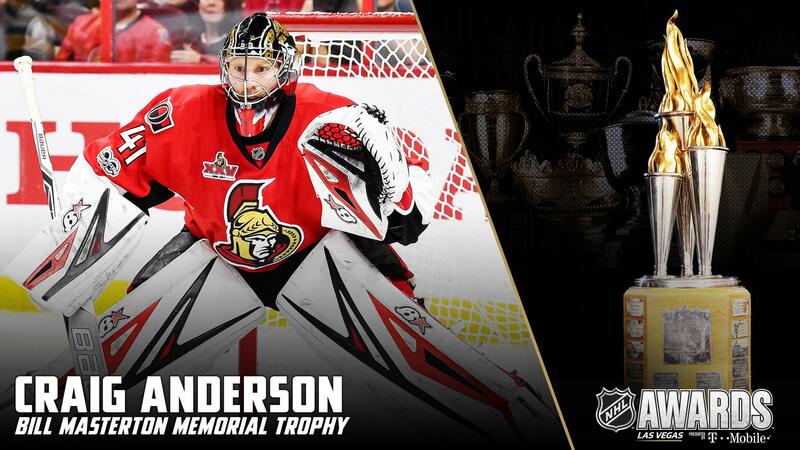 Anderson joined the Senators in time for their next game, making 37 saves in a 2-0 win at the Edmonton Oilers on Oct. 30. Anderson received a standing ovation when announced as the First Star. “I think it took our marriage and relationship to a whole new level to know that when you’re on your lowest point he’s going to be there,” Nicholle Anderson said. Cogliano, 30, was nominated for the Masterton for the fourth time in six seasons with the Ducks. He had 35 points (16 goals, 19 assists), four shorthanded goals and a plus-11 rating in 82 games. Cogliano has played 786 consecutive regular-season games, the longest current streak in the NHL, having never missed a game since making his NHL debut with the Oilers in 2007-08. The only NHL player to play in more consecutive games to begin his career is Doug Jarvis (964 games from 1975-88). Cogliano’s streak is the fourth-longest in NHL history. Ryan, 30, had 29 points (11 goals, 18 assists), including three-game winning goals, in 67 games in his first full NHL season. After playing three seasons with Spokane of the Western Hockey League and going undrafted, Ryan spent four seasons at the University of Alberta and then four seasons playing in Europe. He signed as a free agent with the Hurricanes on June 15, 2015. Ryan played six NHL games last season during four call-ups from Charlotte of the American Hockey League and started this season in the AHL before being recalled Nov. 11. On March 1, 2016, Ryan became the oldest player in Hartford Whalers/Hurricanes history to score a goal in his NHL debut (29 years, 63 days). He’s also the oldest player to make his NHL debut with Carolina.